This brings to an end our live coverage of the dramatic and fast-changing events in Paris, where at least 129 people were killed in attacks on a number of sites across the French capital. Thanks for staying with us. You can still get all the latest updates on this story here. Quote Message: In addition to this we have two thousand French citizens or residents that are, were involved in jihadi networks in Syria and in Iraq, whether they've been staying in France as sympathisers or travelled abroad as jihadists. Six hundred of our citizens are currently fighting in Syria and Iraq and it's the largest European contingent of foreign fighters on the ground." In addition to this we have two thousand French citizens or residents that are, were involved in jihadi networks in Syria and in Iraq, whether they've been staying in France as sympathisers or travelled abroad as jihadists. Six hundred of our citizens are currently fighting in Syria and Iraq and it's the largest European contingent of foreign fighters on the ground." Quote Message: Very soon attention will turn to the question of whether David Cameron and his ministers' arms will be strengthened by the events in Paris on Friday as they formulate policy to confront and take on extremism both in Syria and in this country." A second suspect in the Paris attacks may have travelled to Europe through Greece, Greek officials say. Investigations are now under way, a source says. Earlier it was reported that the holder of a passport found near the body of a gunman who died on Friday had passed through Greece in October. The BBC's Security Correspondent, Frank Gardner, has been considering the implications of the Paris attacks. Under more pressure than ever in the territory they hold, Islamic State militants "are increasingly looking to direct or inspire attacks further afield", our correspondent says. Quote Message: Western counter-terrorism officials had recently come round to the conclusion that while there were still people aspiring to such grand-scale attacks, the prevailing threat was more likely to come from 'self-starters', people like the murderers of British soldier Lee Rigby in Woolwich near London in 2013. In the light of what has happened in Paris and elsewhere, they may now be revising that assessment." Western counter-terrorism officials had recently come round to the conclusion that while there were still people aspiring to such grand-scale attacks, the prevailing threat was more likely to come from 'self-starters', people like the murderers of British soldier Lee Rigby in Woolwich near London in 2013. In the light of what has happened in Paris and elsewhere, they may now be revising that assessment." The father and brother of one of the Paris attackers are now in police custody, sources close to the investigation are quoted as saying by the AFP news agency. A vigil in solidarity with France has been taking place in New York's Washington Square Park. The BBC has put together a fly-through video of the locations where the attacks took place. Yasser Louati, a member of the Collective Against Islamaphobia in France, says the Muslim community is disgusted by Friday's attacks. He told BBC Radio 5live Muslims now live in fear of a backlash. "The reports we are receiving from the ground is that now people are being attacked, mosques are being attacked, death threats are being written all over social media. "Unfortunately less than a year ago when the attacks were carried out against the newspaper Charlie Hebdo and the Jewish supermarket, we provided the wrong answers. "We added more division to division and we have put Muslims as if they were somehow responsible or somehow connected. I fear for the Muslim community right now. People are calling us worried whether they should send their children to school or not on Monday." Information has been emerging about some of the victims of the Paris attacks, but with scores still missing, families and friends are searching on the streets and online. The BBC has gathered all the latest information about those who were killed on Friday. An incident at Paris' Pullman Hotel we reported on a short time ago was a false alert, the French interior ministry says. Police have searched the hotel in the 15th district of Paris - but have found nothing. The intervention was triggered by a tourist who thought he had seen something suspicious, the BBC's Clea Caulcutt in Paris reports. Will Europe's leaders be able to tackle a growing number of challenges, asks the BBC's Europe correspondent Chris Morris. People have gathered in Trafalgar Square to remember those who have lost their lives. French police say there is an ongoing police intervention at the Pullman hotel in Paris. But they have denied reports on social media that shots were fired. Counter terrorism expert Dr Asiem El Difraoui is worried about France's future. Quote Message: One of my biggest fears is that this national unity which was displayed to some degree after the attacks in January against Charlie Hebdo - which was summed up by the slogan 'We are Charlie' - is going away. Even then, some people felt that they were not Charlie, they were not interested in or supportive of terrorism but felt left out because they didn't feel part of the France which is Charlie." One of my biggest fears is that this national unity which was displayed to some degree after the attacks in January against Charlie Hebdo - which was summed up by the slogan 'We are Charlie' - is going away. Even then, some people felt that they were not Charlie, they were not interested in or supportive of terrorism but felt left out because they didn't feel part of the France which is Charlie." Officials and players from Denmark and Sweden have held a minute's silence in the Swedish city of Solna ahead of the first leg of their Euro 2016 play-off. President Obama has held a meeting of his National Security Council before leaving for a summit in Turkey. At the briefing he was told there was "no information to contradict the initial French assessment of ISIL's responsibility", using an alternative acronym for Islamic State. One of the victims of the attack has been named as Nohemi Gonzalez, 23, a US student at California State University who was taking a term abroad at a Paris institution. I'm deeply saddened by the news of the passing of Long Beach State University student Nohemi Gonzalez. Our thoughts and prayers are with her family and friends during this sad time." The founder of the website Rue 89 and former deputy editor of Liberation Pierre Haski told the BBC he is concerned about what impact the attacks could have on Paris. Quote Message: If you go out and have dinner or go to a concert and you end up dead what does that mean for the life of a city like Paris? I think people still have to reckon with the consequences of what happened." If you go out and have dinner or go to a concert and you end up dead what does that mean for the life of a city like Paris? I think people still have to reckon with the consequences of what happened." Prince Charles, right, observes one minute's silence in the Australian city of Perth. Belgian Prime Minister Charles Michel says investigations are under way to determine whether one of the suspects arrested in Brussels today was in Paris on Friday evening or not, Belgian daily Le Soir reports. One of the suicide attackers at France’s national football stadium, the Stade de France, had a ticket and tried to enter with a match under way, the Wall Street Journal reports. The newspaper spoke to a security guard who said the male attacker was discovered wearing an explosives vest at the entrance where he detonated it. French President Francois Hollande (centre) has visited the Saint-Antoine hospital in Paris, where a number of the injured in the attacks are being treated. A Briton killed at the Bataclan concert hall in Paris has been named as Nick Alexander. He was selling merchandise at the venue. His family have issued a statement. Quote Message: It is with huge sorrow that we can confirm that our beloved Nick lost his life at the Bataclan last night. Nick was not just our brother, son and uncle, he was everyone's best friend - generous, funny and fiercely loyal. Nick died doing the job he loved and we take great comfort in knowing how much he was cherished by his friends around the world." It is with huge sorrow that we can confirm that our beloved Nick lost his life at the Bataclan last night. Nick was not just our brother, son and uncle, he was everyone's best friend - generous, funny and fiercely loyal. Nick died doing the job he loved and we take great comfort in knowing how much he was cherished by his friends around the world." Eyewitness Igor Meldenovic was having dinner close to the Bataclan when he saw scores of people running for their lives. "I don't feel fortunate," he tells the BBC. "I feel very angry that I was not able to help the people who were getting killed around me.You can't feel relieved when you're in this kind of situation. You can only think of those who've lost their lives needlessly." French Prime Minister Manuel Valls says France will continue air strikes in Syria, targeting Islamic State, Reuters reports. French midfielder Lassana Diarra has revealed he lost his cousin in the attacks. Diarra was playing for his country last night at the Stade de France - the scene of one of the attacks. Quote Message: As you may have read, I was touched personally by the attacks. My cousin, Asta Diakite, was among the victims of one of the shootings yesterday, along with hundreds of other innocent French people. She was like a big sister to me." As you may have read, I was touched personally by the attacks. My cousin, Asta Diakite, was among the victims of one of the shootings yesterday, along with hundreds of other innocent French people. She was like a big sister to me." A special edition of France's Liberation newspaper will hit news stands on Sunday. One of the bombers was born in the Paris suburb of Courcouronnes in 1985, Mr Molins says. He was known for petty crimes committed between 2004 - 2006. Intelligence services reported that he was radicalised in 2010, but he was not known to be part of any network. The Paris prosecutor also reveals that three people were arrested on Saturday morning, including one at the French-Belgian border. Mr Molins says one of the attackers was from a Parisian suburb and had been known for past criminal acts. Another attacker had a Syrian passport. Mr Molins says all the attackers had automatic Kalashnikov weapons. More from the Paris prosecutor, who says "three co-ordinated teams" appear to have been behind Friday's attacks. Quote Message: We have to find who these people are, who their accomplices are, who ordered this, where they come from, how they were financed." We have to find who these people are, who their accomplices are, who ordered this, where they come from, how they were financed." Mr Molins says 99 people are still in critical conditions. He also mentions that in one of the attacks, gunmen used a black Seat vehicle. At a news conference, Paris prosecutor Francois Molins says 129 people were killed in Friday's attacks and another 352 injured. You can follow his comments live. At least one Briton died in the Paris attacks, the British Foreign Office says, who also fears there could be a "handful" of other British fatalities. The 28-member European Union has called for a minute's silence to be held on Monday at 11:00 GMT for the victims of the Paris attacks. In picture after picture, one symbol keeps emerging as people pay tribute to Paris and the victims of the attacks. Theresa Cede, who was in the audience at the Bataclan, recounts the horror of Friday's attack. She tells BBC Radio 5live: "There were grenades, or one grenade at least that I know of. Body parts flying around, people shouting, screaming. "But then, you know, at the moment, like, everybody who could would become as quiet as possible, just not to move. And it lasted a lifetime or an eternity. It was like, probably an hour. "I got more or less buried under a man who was shot in the head next to me. And so I was underneath him. And from there nobody moved. "But then they shot anyway. I was thinking to myself, is it going to be me next? That's what went through my head. The names of some of those killed in the attacks have begun to emerge. They include Djamila Houd, aged 41, from France; Thomas Ayad, 34, also from France, who was killed at the Bataclan; and - as we reported earlier - LSE graduate Valentin Ribet is also reported to be among the dead. Belgium, Portugal and Sweden have all said some of their nationals are among those killed but details have not been released. The BBC has been looking at Le Carillon, a cafe-bar in central Paris that was one of last night's attack sites. But locals are defiant. I'm not scared to go out in this area now, because you can't just stay at home as this would mean to give in to fear." The Belgian justice minister says "a number" of arrests have been made in Brussels in relation to the Paris attacks, according to the Associated Press news agency. This comes after police raided a neighbourhood of the Belgian capital earlier on Saturday. Martin Roschitz, from Germany's NDR Radio, was at the Stade de France stadium for Friday's match between France and Germany. He tells BBC World Service: “After the match the German players came up into the tunnel and expected us to interview them, but we had no questions and we were all sad and deeply shocked about the circumstances. "The players didn’t realise what had happened, and in the end team manager Oliver Bierhoff informed the players and then they tried to phone their relatives and friends. The Notre Dame cathedral will hold a memorial service for the victims of the attacks on Sunday at 17.30 GMT, reports the BBC's Clea Caulcutt in Paris. Public figures are expected to attend and Parisians will be allowed inside the cathedral. Services will be maintained on Sunday in Paris churches and parishioners will hold prayers for the victims. EU leaders have issued a joint statement saying that "everything that can be done at European level to make France safe will be done". A Greek government minister says the holder of a Syrian passport found at the scene crossed into the European Union through the Greek island of Leros in October. Quote Message: On the case of the Syrian passport found at the scene of the terrorist attack, we announce that the passport holder passed from Leros on October 3 where he was identified based on EU rules ... We do not know if the passport was checked by other countries through which the holder likely passed. On the case of the Syrian passport found at the scene of the terrorist attack, we announce that the passport holder passed from Leros on October 3 where he was identified based on EU rules ... We do not know if the passport was checked by other countries through which the holder likely passed. At a news conference in Vienna, US Secretary of State John Kerry said America is determined "to eliminate the evil of terrorism". "And, believe me, this determination is only stronger" after the Paris attacks, Mr Kerry said. Police are searching a neighbourhood of the Belgian capital Brussels in connection with the Paris attacks, with one person arrested, reports say. Downing Street believes that a small number of British citizens were caught up in the Paris attacks. "While we have now confirmed the safety of many British citizens, we are concerned that a small number of British nationals have been caught up in the attack," a spokesman said. "Our Embassy in Paris are working urgently with the French authorities to find out more and we have deployed additional consular staff and a team from the Metropolitan Police to assist them with this task." The statement followed a meeting of the Cobra security committee chaired by David Cameron. Mr Cameron will travel to the G20 in Turkey tomorrow as planned, the spokesman said. Police have arrested a 41-year-old Frenchman after "what appears to be a firearm" was discovered at Gatwick airport. The airport's North terminal was evacuated and flights cancelled earlier today following a security alert. The man is being interviewed as we try to determine the circumstances of the incident, but at this time it is too early to say what his intentions, if any, were. However, given the events in Paris on Friday evening, there is heightened awareness around any such incident and it is best that we treat the matter in all seriousness." The North Terminal has now reopened. French schools will open on Monday and a minute of silence will be held in the morning, French Interior Minister Bernard Cazeneuve says. The attacks have had a major impact on daily life in France - troops and police have been deployed around the country, public demonstrations banned until Thursday, sports events cancelled and major landmarks closed. The Paris attackers were members of a self-contained cell and had travelled to Syria, the BBC's Frank Gardner reports, citing Whitehall sources. This is the book of condolences at the French embassy in Berlin. Among the signatures on the page is that of German Chancellor Angela Merkel. Marie Cartal lives above La Casa Nostra restaurant, where at least five people died. She spoke to the BBC's Gavin Lee. Quote Message: It was really shocking. It was the first time in my life I saw someone dying in front of me. I mean people there were just sitting outside having a drink. They were not politicians, they were not politically engaged. They were just enjoying the beginning of the weekend. So, why?" It was really shocking. It was the first time in my life I saw someone dying in front of me. I mean people there were just sitting outside having a drink. They were not politicians, they were not politically engaged. They were just enjoying the beginning of the weekend. So, why?" The London School of Economics has paid tribute to a graduate of the university who it says died in the attacks. Valentin Ribet was a business law student at LSE last year. Dutch authorities have grounded a France-bound airliner at Amsterdan's at Amsterdam's Schiphol airport after a threatening tweet was received concerning the flight. A police spokesman said that authorities had been searching the plane, operated by Franco-Dutch airline Air FranceKLM, for about an hour. It was supposed to depart around 13:45. Earlier on Saturday, Dutch Prime Minister Mark Rutte announced heightened security measures for all traffic going from or to France. Businesses have closed and events been cancelled across France in the wake of the attacks in Paris. Sir Bernard Hogan-Howe, the Metropolitan Police Commissioner, has discussed London's preparedness for the sort of attack seen in Paris on Friday. "We've done an awful lot of preparation," he said, but "last night was different". Quote Message: What we have to do is reflect on what happened in Paris last night, about the way in which the attack took place. We'll want to know the people who were involved, we'll want to know the motive behind the attack and we'll want some very tactical things: Where did they get the weapons? Where did they get the ammunition? Is there anything we can learn in this country to either help the French in their bid to cut off that supply or make sure that neither the people involved or the weapons involved materialise on the streets of this city or any part of this country?" What we have to do is reflect on what happened in Paris last night, about the way in which the attack took place. We'll want to know the people who were involved, we'll want to know the motive behind the attack and we'll want some very tactical things: Where did they get the weapons? Where did they get the ammunition? Is there anything we can learn in this country to either help the French in their bid to cut off that supply or make sure that neither the people involved or the weapons involved materialise on the streets of this city or any part of this country?" Jeremy Corbyn, leader of Britain's opposition Labour party, has added his voice to those condemning the attacks. Today, all our thoughts and sympathy are with the people of Paris. What took place in the French capital yesterday was horrific and immoral. We stand in solidarity with the people of France - as with all victims of terror and violence. It's vital at a time of such tragedy and outrage not to be drawn into responses which feed a cycle of violence and hatred." Marine Le Pen, leader of France's far-right opposition National Front party, has taken a typically hardline position in response to the attacks. "For the sixth time in 2015, Islamist terrorism has hurt our country. France is crying for its dead and I am crying with it," she wrote on Twitter. "It is essential France retakes control of its borders, definitively." "Fundamentalist Islam must be destroyed, radical mosques closed, radical imams expelled." 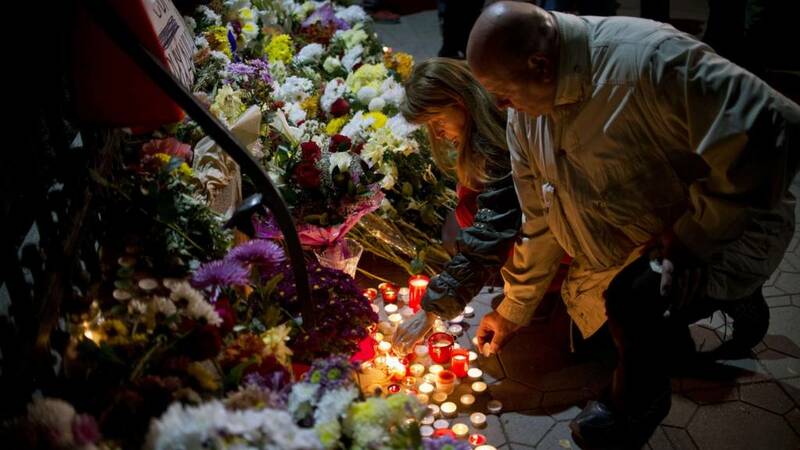 People have been paying their respects at French diplomatic buildings around the world. An Egyptian passport and Syrian passport were found on two attackers at the Stade de France, according to the French newspaperLa Liberation. As reported previously, French police say one of the perpetrators at the Bataclan siege was identified by his fingerprints as a Frenchman who was known to security services. BBC cameraman Jack Garland has just finished filming with a survivor of the Bataclan concert hall attack. "He was unharmed but then I noticed this," Garland said. You can see the interview tonight on a special edition of Newsnight on BBC 2, 8pm. Paris hospitals are treating 300 victims from the Paris attacks, according to new figures: 80 people remain in a state of "absolute emergency", 177 are in state of "relative emergency", 43 are witnesses and relatives, and 53 people have been discharged. French news agency AFP are reporting that a Frenchman has been identified as one of the concert hall attackers. Earlier reports in French media said a Frenchman had been identified by his fingerprints as someone known to security services, but it is not certain whether the reports relate to the same suspect. There are calls on Facebook for people to gather at Trafalgar Square in London this evening to hold a solidarity rally for the victims of Friday's attacks. Davide Martello brought a moment of relative calm on Saturday to the area around the Bataclan concert hall, where scores of people died in the attacks. Mr Martello played John Lennon's Imagine on a piano attached to his bicycle for a small crowd. He previously played at the sites of the Charlie Hebdo attacks, as well as at the Maidan protest in Ukraine, Taksim Square in Istanbul, and in Afghanistan. You can follow all of the BBC's correspondents reporting from the ground with our Twitter list. France's interior minister Bernard Cazeneuve has authorised local authorities to impose curfews if needed following the attacks in Paris. In a televised address, Mr Cazeneuve confirmed that officials had banned all public demonstrations until Thursday. He also laid out increased security measures across the country, including 1,000 additional troops, mostly in Paris, and special protection for certain public buildings. This is on top of the 30,000 police officers and soldiers mobilised in the aftermath of Charlie Hebdo attacks. One of Paris' most iconic landmarks - the Eiffel Tower - is to remain closed "until further notice", the site's operator has said. The attraction is normally visited by 20,000 people a day. The BBC's Imelda Flattery is at La Belle Equipe, one of the restaurants targeted in the attacks. Paris police have put out an alert about a black Seat car, with a foreign numberplate - GUT 18053 - and five-spoke alloy wheels. The vehicle is wanted in connection with the attacks yesterday. Members of the public are advised not to approach the vehicle. Scotland's First Minister Nicola Sturgeon has joined leaders offering condolences to the people of France. Paris is, predictably, in a febrile state. Reports of shooting in the suburb of Bagnolet spread online and a police helicopter was dispatched overhead. Police are now saying the noise was firecrackers set off by a wedding party. Likely prompted by the rumours about Bagnolet, Paris's city police department has tweeted a warning about spreading false information. It says: "Do not distribute or relay false information or false rumours." Police have confirmed they have arrested a man suspected of discarding a package at the North Terminal of Gatwick airport. Specialists have been called to the airport to investigate the item. The terminal has been evacuated, and some flights have been delayed. Detective Superintendent Nick May said: "At this time, we are investigating the circumstances of the incident and it is too early to say what the item may be. "However, given the events in Paris on Friday evening, there is heightened awareness around any such incident and it is best that we treat the matter in all seriousness. "We are aware that there is concern about what has happened in France, but the general threat level remains the same and people should be aware as usual of anyone acting suspiciously." David Cameron has made a statement at Downing Street, saying the threat from the so-called Islamic State is "evolving", and becoming more acute. "We in the UK face the same threat," he said. "We will redouble our efforts to wipe out this poisonous extremist ideology." In the light of last night's attacks, the UK will review its terror plans and attempt to learn from what happened in Paris, he said. Mr Cameron called the attacks the "worst act of violence in France since World War Two". He said Britain stands with France "shocked but resolute, in sorrow but unbowed". "While full picture is still emerging, we must be prepared for a number of British casualties, and we will do whatever we can to help those in need." Long lines are forming outside hospitals as Parisians queue up to donate blood. Many are sharing pictures and information about which hospitals are most in need using the hashtag #dondusang. The hashtag #porteouverte (open door) was also used throughout the night to offer rooms to anyone who needed somewhere to stay. The Queen has sent a message to President Hollande, saying: "Prince Philip and I have been deeply shocked and saddened by the terrible loss of life in Paris. We send our most sincere condolences to you, the families of those who have died and the French people." David Cameron has warned that "we must be prepared for a number of British casualties" from the Paris attacks, as he condemned the "brutal and callous murderers". Bavaria's state premier Horst Seehofer has said that there is "reason to believe" that a man arrested last week with several weapons in southern Germany is linked to the attacks in Paris. "There is reason to believe that this is possibly linked" to the attacks, Mr Seehofer told a party conference. Police made the arrest on 5 November during a routine check on a motorway and said they found "many machine guns, revolvers and explosives" in the suspect's vehicle. A Syrian passport has been found on the body of one of the attackers, AP reports, citing police sources. French TV is carrying the same line, but it has not been independently verified by the BBC. Boris Johnson: "They will not succeed"
Boris Johnson, the Mayor of London, has spoken about the attacks in Paris, which he called "our sister city". "I have written this morning to Mayor Hidalgo to convey the sense of shock and grief of millions of Londoners at the tragic events in Paris. Our thoughts today are with the victims and their families and with the whole French people. "We regard Paris as our sister city, a place for which we have deep reserves of love and admiration and respect. We are two capitals united in our values - democratic freedom, openness and tolerance. "The people who launched the attacks last night have no such values. They wish to undermine the things we hold most precious. They want to set neighbour against neighbour. They want to spread fear. "They will not succeed. As president Hollande has rightly said, they must and will be defeated. We stand ready in London to do everything in our power - to do whatever it takes - to assist in a struggle that embraces us all." David Cameron, who is expected to make a statement shortly on the attacks, tweeted a message of solidarity to the French. Ahmad al-Tayyib, the Grand Imam of Al-Azhar (one of the highest Sunni authorities in the Muslim world) has strongly condemned the attacks in Paris, state news agency Mena reports. Speaking during an international conference organized by the Ministry of Religious Endowments today, Al-Tayyib called the Paris terror attacks "chaotic", and stressed that Islam is innocent of terrorism. He also called for international cooperation to counter terrorism. Israel will fly its flags at government offices and embassies abroad at half mast as a sign of solidarity with the French people, BBC Jerusalem producer Gidi Kleiman reports. Quote Message: Israel stands shoulder to shoulder with French President Francois Hollande and with the people of France in our common battle against terrorism. On behalf of the people of Israel, I send condolences to the families of those murdered and wish a speedy recovery to the wounded. Israel stands shoulder to shoulder with French President Francois Hollande and with the people of France in our common battle against terrorism. On behalf of the people of Israel, I send condolences to the families of those murdered and wish a speedy recovery to the wounded. The claim was issued in written format in French and Arabic, and in audio format, all via established IS channels, according to the BBC's jihadist media expert Peter King. The statement claims that "eight brothers wearing explosive vests and assault rifles targeted carefully chosen locations in the heart of the French capital". It goes on to call Paris the "capital of abomination and perversion". "In a holy attack facilitated by Allah, a group of believers and soldiers of the caliphate – may Allah give it might and victory – targeted the capital of abomination and perversion, the one that carries the banner of the cross in Europe, Paris." The Prince of Wales has condemned the Paris incidents as "bestial attacks" and said he wanted to express his "utter, total horror" at what had happened. The so-called Islamic State group has claimed responsibility for the attacks in Paris. In a statement published online, the jihadist group said the attacks were designed to show France it remained a "top target". The group claims it studied the target locations and carried out the attack using "eight brothers wearing explosive belts and carrying assault rifles". Russia is considering restricting flights from Moscow to Paris according to Russian news agency RIA, which cites Alexander Neradko, the head of Russian aviation regulator Rosaviatsiya. Transport safety measures will also be implemented across the country following the Paris attacks, the agency reports. Paris police have placed a temporary ban on demonstrations in the city and surrounding areas until Thursday. Police are encouraging people who want to organise gatherings in private locations to postpone them, or to reinforce security. Russian Foreign Minister Sergei Lavrov says international powers must do "much more" to fight Islamic State and groups like it, Reuters reports. There is no justification for terrorist acts and no justification for us not (to do) much more to defeat ISIS, al-Nusrah and the like. A number of famous buildings around the world have bit lit up in the colours of France's Tricolour flag. Among them are Sydney Opera House, the CN Tower in Toronto and the spire of 1 World Trade Center in New York. Red, white, and blue will be projected onto Tower Bridge in London on Saturday night. The North Terminal at London Gatwick Airport has been evacuated. Sussex Police told the BBC they are dealing with a suspicious package. Connor Gillies, a Capital FM news reporter, tweeted a picture showing people making their way outside the terminal. The Kremlin press service has published the text of a telegram sent by President Putin to Francois Hollande earlier today. "I would like to express my deepest condolences to you personally and all the people of France in connection with the death of a large number of civilians as a result of an unprecedented series of terrorist attacks in Paris," Mr Putin wrote. "This tragedy became another evidence of barbaric nature of terrorism which poses a challenge to human civilization. It is obvious that effective fight against this evil requires a real combined effort of the entire international community. "I would like to confirm that the Russian side is ready for the closest possible cooperation with French partners in the investigation of this crime committed in Paris. I expect that its paymasters and perpetrators will be punished." Mr Putin's ally Bashar al-Assad, the president of Syria, has also made a statement on the attacks, taking the opportunity to make his own case in the process. "What France suffered from savage terror is what the Syrian people have been enduring for over five years," he was quoted as saying by Syrian state media. In London, the Lord Mayor's Show will go ahead as planned "in solidarity with Paris", with the Lord Mayor leading a two minute silence from the balcony at The Mansion House at 11:00 GMT, the City of London Corporation says. Union flags will be flying at half-mast at Guildhall, The Mansion House and Old Bailey, and Tower Bridge will be lit in the colours of the Tricolor from sundown tonight. Dave Lee, the BBC's North America technology reporter, has written about the role of social media in situations like the one unfolding in Paris. Quote Message: It may seem trivial to even care about social media during moments like this - in happier moments it can seem like a place for selfies, holiday photos and banal arguments in 140 characters. But during a crisis social media becomes the single most significant platform for news to be spread, eyewitness experiences to be shared and official statements to be made. And inevitably, these same channels amplify misinformation, allowing rash judgements and prejudices to boil to the surface, fuelling fear and ignorance. It may seem trivial to even care about social media during moments like this - in happier moments it can seem like a place for selfies, holiday photos and banal arguments in 140 characters. But during a crisis social media becomes the single most significant platform for news to be spread, eyewitness experiences to be shared and official statements to be made. And inevitably, these same channels amplify misinformation, allowing rash judgements and prejudices to boil to the surface, fuelling fear and ignorance. German authorities have made arrests in Bavaria, BBC Europe Editor Katya Adler reports. Francois Hollande has said the Islamic State is behind the attack in Paris, which he called an "act of war". Mr Hollande said the attacks had been planned and organised from abroad with help from inside France. He also declared three days of national mourning. There are reports on Twitter that the media arm of the Islamic State group - the Al-Hayat Media Centre - has claimed responsibility for the attack. Western journalists on Twitter in the past hour have reported that IS published a claim through the Al-Hayat Media Center. Initial research suggests these reports possibly are based on IS supporters reposting a November 2014 French-language Al-Hayat Media Center video and tagging it with hashtags associated with the Paris attack. We have not yet seen a claim of responsibility. The military is once again a very visible presence on the streets of Paris, after a deployment earlier this year following the Charlie Hebdo attacks. An additional 1,500 troops have been stationed around the city to protect sensitive sites. Paris hospitals are in need of blood donations. The website of the city's blood donation service Don Du Sang appears to have crashed. Images shared on social media show Parisians queuing up at hospitals to donate. Italy is adopting heightened security measures following the attacks in Paris, Prime Minister Matteo Renzi said. In a television address, Mr Renzi said the attacks were against "all of humanity" and against "our way of life". He has convened a meeting of Italy's national security council to discuss the threat. Iranian President Hassan Rouhani had been expected to arrive in Rome on Saturday and fly onto Paris on Sunday, but cancelled his visit following the attacks. British Airways is still flying into Paris but has warned travellers to expect delays due to extra security checks at French airports. BA says passengers who do not wish to travel to Paris will be able to delay their flight to another day in the next two weeks or re-book to an alternative destination. You can check information about your flight here. Police forensics teams have begun working at several of the shooting locations. French prosecutors have a provisional death toll of 128 with another 99 in critical condition, Reuters reports. Angela Merkel has added to her earlier statement, saying the attackers in Paris "hate freedom". Speaking to reporters in Berlin, the German chancellor said the victims "wanted to live the life of free people in a city that celebrates freedom", and called the gunmen "murderers who hate precisely this life of freedom". Germany has offered its counter-terrorism resources to France to aid the investigation. The attack "was aimed not just at Paris, it targeted and it hits all of us," she added. Daniel Psenny, a journalist from French newspaper Le Monde, has posted dramatic video footage of people escaping from the Bataclan concert hall while gunfire rings out in the background. Psenny, whose apartment overlooks one of the building's emergency exits, filmed concertgoers climbing out of windows to escape. Many are screaming as they run, some are clearly wounded and others dead. The government has also cancelled all sporting events in the city this weekend. Francois Hollande is currently holding an emergency security meeting with ministers and military chiefs. An additional 1,500 soldiers have been mobilised to guard Paris's parliament buildings, religious sites, and tourist attractions. Schools and universities, many of which normally open on Saturdays, have been closed as part of emergency security measures across the city. The government has also reimposed border controls that were abandoned as part of Europe's free-travel zone. Border and customs officers will check people, baggage and vehicles entering and leaving France by road, train, sea or plane, said customs official Melanie Lacuire. French authorities have asked people to remain at home for the time being, while some uncertainty remains over whether all of the attackers were killed. People appear to be returning to the streets, however. Peter Neumann, Professor of Security Studies at King's College London, spoke to BBC Radio 4's Today programme about the effect of terror attacks on societies. This is the attack everybody has been dreading for at least a couple of years. This is really important because it is the essence of terrorism, it is not only about people being killed it is about creating a political effect. What worries me the most is that we will see in France and other European countries a polarisation, with different extremists egging each other on. People on the far right trying to take advantage. It's about dividing societies. This was a big attack but even relatively small attacks are dangerous because of the political situation, because of the chain reaction they can cause. Moving footage has emerged showing Parisians singing the French national anthem as they are evacuated from the Stade de France. It is not yet known how many people died at the stadium, where two bombs were detonated during a friendly between France and Germany. Click on the link in the tweet below for the video. Flowers have been laid at French embassies around the world in memory of those who died in Paris. The Vatican has issued a statement calling the violence in Paris "an attack on all humanity". "We condemn (it) in the most radical way together with The Pope and all those who love peace," said Vatican spokesman Father Federico Lombardi in a statement. The statement calls for "a decisive, supportive response on the part of all of us as we counter the spread of homicidal hatred in all of its forms". Here's a recap on the locations targeted on Friday. There were six separate attacks, believed to have been carried out by at least eight perpetrators. Five of the attacks took place in the city's 10th and 11th districts, with gunmen targeting bars and restaurants and the Bataclan concert venue, where US band Eagles of Death Metal was performing. A bomb attack targeted the Stade de France in the north of the city, where the French national football team were playing Germany with President Francois Hollande watching. France has tightened its border controls in the wake of the attacks in Paris, but most air and rail services appear to be running normally. American Airlines announced earlier it had temporarily suspended flights into the city, but other airlines continue to operate as normal. Train services are also running, including the Eurostar. The BBC's Ben Brown tweets that his fully booked train from London to Paris is nearly empty. It's seven years since a major terror attack in Mumbai used similar tactics to those seen in central Paris on Friday. Europe Correspondent Damian Grammaticas has this on the implications for France and for European security. What happened in Paris last night is exactly what Europe's security services have long feared, and tried to foil. Simultaneous, rolling attacks, with automatic weapons and suicide bombers in the heart of a major European city, targeting multiple, crowded public locations. These tactics have been used before in Mumbai and elsewhere. But how they've come to Europe many questions will have to be answered. Were the attackers French citizens, if so, how they were radicalised, armed and organised? In France, in Syria, by whom? Why weren't they detected? Is France, after two major attacks this year, uniquely vulnerable? Or does the carnage in Paris mean all of Europe faces new threats to our public places and events? And if a Syrian link is proven, will France recoil from that conflict or will it redouble its commitment to the fight against radical groups there? This 'Peace for Paris' symbol created by artist Jean Jullien has been widely shared online following the attacks. Obama: "An attack on all humanity"
President Obama called the attacks in Paris an "outrageous attempt to terrorise innocent civilians" and an "attack on all of humanity". German Chancellor Angela Merkel said she was "deeply shaken by the news and pictures that are reaching us from Paris". Canadian Prime Minister Justin Trudeau said: "Our hearts and thoughts and prayers go out to our French cousins in this dark and terrible time." And the President of China, Xi Jinping telephoned Francois Hollande to say China is willing to cooperate with France in the fight against terrorism. UK Prime Minister David Cameron will chair a meeting of the government's Cobra emergency committee following the attacks. Reuters reports that Iran's president Hassan Rouhani has cancelled a planned trip to Italy and France because of the attacks in Paris. "Due to the terrorist incidents in Paris and in coordination with the hosts, the Iranian president postponed his visit to Italy, Vatican and France to a more convenient time," Iran's foreign minister, Mohammad Javad Zarif, told state television, according to IRNA. Quote Message: He was left handed and shooting in bursts of three or four shots. It was fully intentional, professional bursts of three or four shots. He killed three or four individuals who were sitting in the chairs in front of the cafe. We saw them get shot down. They fell off their chairs onto the ground. He then swivelled and shot through a car drivers’ window. We then saw him walk into the cafe. He swivelled right and then swivelled left and opened fire. That is when we dived for cover. We heard a total of maybe 15 or 20 shots, then everything went quiet. He was left handed and shooting in bursts of three or four shots. It was fully intentional, professional bursts of three or four shots. He killed three or four individuals who were sitting in the chairs in front of the cafe. We saw them get shot down. They fell off their chairs onto the ground. He then swivelled and shot through a car drivers’ window. We then saw him walk into the cafe. He swivelled right and then swivelled left and opened fire. That is when we dived for cover. We heard a total of maybe 15 or 20 shots, then everything went quiet. French TV station iTele interviews a man who was near the Stade de France when an explosion took place. Sylvestre says he was saved by his phone, which protected his head from shrapnel, and by his leather jacket, which reduced the impact of more shrapnel when it hit him on his body. Those left physically unscathed by the attack at the Bataclan concert venue have been taken to a special crisis centre for psychological support. Some walked in dazed, their shoulders draped with emergency blankets, AP reported. Emergency workers and Red Cross workers in orange vests gathered in front of the building, the headquarters of Paris' 11th arrondissement. After meeting with counselors, some survivors were put in taxis to head home. BBC journalists on the ground in Paris and elsewhere are tweeting about the attacks and their aftermath - follow this list to see their updates. Amateur footage has captured the panic at the Stade de France in Paris, following an explosion that is reported to have been a suicide blast. People are seen running outside the stadium, then a convoy of emergency vehicles arrives. The band scheduled to headline at the Bataclan concert hall - the Eagles of Death Metal - survived the attack by four militants that killed about 80 people, the BBC understands. The AFP agency is reporting eight militants have been killed, quoting an investigation source. Seven of the eight died after they detonated suicide belts, the source said. Four were killed in the Bataclan concert hall, three by activating their suicide vests and one shot by police. Three more died near the national stadium and a fourth was killed in a street in eastern Paris. Two Swedish citizens may be among the victims of the attacks, the country's foreign ministry says. "We have information that one person of Swedish nationality was wounded by gunfire and another was killed," said Johan Tegel, a ministry spokesman. A source close to the investigation has told AFP that more than 200 people were wounded in the attacks, 80 seriously. Quote Message: I went to the window and there was this guy with a kalashnikov firing. It was at the corner and he was firing in all directions. Then a car came and he entered the car and it went away. There were three guys who were not killed by this killer. I did not expect such a terrifying situation. I saw... people going to a body on the ground and I called the police. I went down to the street and realised that in a bar there were four or five more bodies. There were cars where the driver and the passenger were dead. The police told everyone to go home. I stayed at home without lights. A few minutes later there was a knock on my door and the police asked if they could use my apartment. I stayed in the bathroom because it was the safest place and I did not want to distract the police. I think they stayed at the window, they were fully armed." I went to the window and there was this guy with a kalashnikov firing. It was at the corner and he was firing in all directions. Then a car came and he entered the car and it went away. There were three guys who were not killed by this killer. I did not expect such a terrifying situation. I saw... people going to a body on the ground and I called the police. I went down to the street and realised that in a bar there were four or five more bodies. There were cars where the driver and the passenger were dead. The police told everyone to go home. I stayed at home without lights. A few minutes later there was a knock on my door and the police asked if they could use my apartment. I stayed in the bathroom because it was the safest place and I did not want to distract the police. I think they stayed at the window, they were fully armed." The train operator says services will still run on Saturday, despite controls at the French border. French police say four attackers were killed at the Bataclan concert hall, including three who died by detonating their suicide belts. AFP is reporting a prosecutor in Paris saying accomplices of attackers may still be on the loose. One World Trade Center - the site of the 9/11 attacks - is illuminated in the colours of the French tricolore. The Belgian authorities have told AFP news agency that they have boosted checks on their borders, especially with France, following the attacks in Paris. "Reinforced border checks have been established on the borders within the framework especially of a close collaboration with the French authorities," Belgium's national centre for threat evaluation, OCAM, said. Paris prosecutor says five attackers may be dead in attacks across city, AP reports. President Francois Hollande has been speaking outside the Bataclan, where about 100 people are reported to have been killed. Quote Message: We wanted to be here among all those who saw these atrocious things, to say that we are going to fight and our fight will be merciless, because these terrorists that are capable of such atrocities need to know that they will be confronted by a France that is determined, unified and pulled together and a France that will not let itself be overawed even if today it is expressing an infinite amount of emotion at this drama and this tragedy, which was an abomination and a barbaric act. We wanted to be here among all those who saw these atrocious things, to say that we are going to fight and our fight will be merciless, because these terrorists that are capable of such atrocities need to know that they will be confronted by a France that is determined, unified and pulled together and a France that will not let itself be overawed even if today it is expressing an infinite amount of emotion at this drama and this tragedy, which was an abomination and a barbaric act. Canadian PM offers "all possible assistance"
Quote Message: Canada stands with France at this dark time and offers all possible assistance. We will continue to work closely with the international community to help prevent these terrible, senseless acts. Our thoughts and prayers are with the people of France and we mourn their loss." Canada stands with France at this dark time and offers all possible assistance. We will continue to work closely with the international community to help prevent these terrible, senseless acts. Our thoughts and prayers are with the people of France and we mourn their loss." The death toll being reported in different outlets does vary - but all put the number of dead as at least 118. American Airlines has delayed its flights to Paris in response to the attacks, Reuters reports. "Currently Charles de Gaulle International Airport is open, however, we are holding our remaining departures this evening to Paris until we have additional information," American Airlines spokesman Joshua Freed told the news agency. The French foreign ministry told Reuters that airports would remain open, and flights and train service would continue. Reuters reports that all schools and universities in the Paris region will be closed tomorrow. Reuters. quoting an un-named official at Paris City Hall, says the current death toll in Paris is around 140. In the last few minutes, however, the iTele channel said the latest toll is 118 dead. Some reports in France, however, say there may be up to four attackers dead.